If the cold days of January are starting to make you feel a bit grey, how about a royal wedding dress covered in daisies to celebrate a golden anniversary to brighten things up? Today marks the anniversary of the marriage of Princess Margriet of the Netherlands and Pieter van Vollenhoven and, just like this rather happy royal couple, the wedding gown of January 10th 1967 has stood the test of time. Like the amazing detail on this dress, the royal wedding of Margriet and her university sweetheart is easy to pass over. 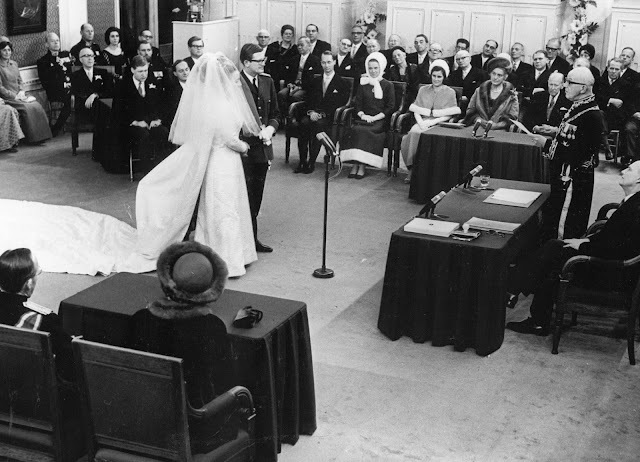 The bride was the third of Queen Juliana of the Netherlands' daughters to get married in as many years but unlike her sisters, Margriet managed to say 'I do' without attracting any of the controversy that had surrounded the other two royal weddings. Instead, this January bride's big day was filled with joy and a rather regal guest list. And her wedding dress fitted the bill to perfection. At the time, Margriet was second in line to her country's throne so the gown needed to be grand but as her sister, Beatrix, was close to having her first baby, this was also the dress of a spare preparing to shuffle down the line of succession. And it had a very personal air about it, too. If anyone didn't know that Margriet means daisy, by the time this bride had walked into the room everyone was more than aware of the fact. 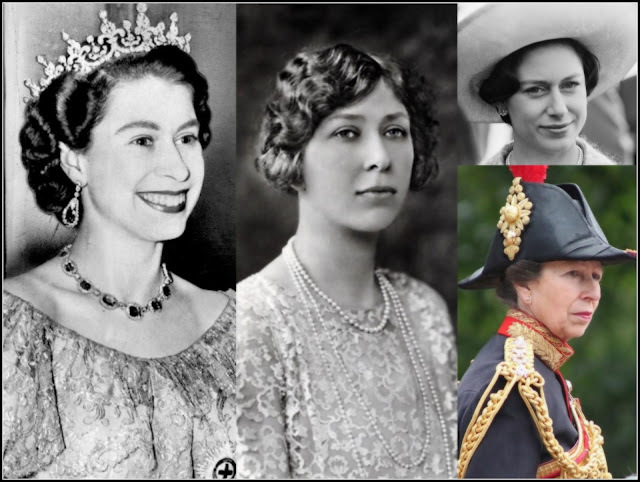 The fabric of her gown, from the collar of the dress to the tip of the train, was embroidered with daisies of all shapes and sizes while the tiara she picked from the enviably extensive royal collection features pearl and diamond buttons in the shapes of flowers. There are precisely no prizes for guessing the flowers in Margriet's bouquet. This wedding day was all about daisies. However, the embellishments are so well done that they are far from the first thing you notice about this very 1960s wedding dress. The shape and style is the embodiment of the later part of that decade with a high collar, fitted bodice, long sleeves and sleek skirt. It was designed by Caroline Berge-Farwick of Maison Linette who had been responsible for the gown worn by Margriet's sister, Beatrix, for her own wedding the year before. And just like big sister, Margriet had a big say in how the final design turned out. All royal wedding dresses need a train and Margriet took the sensible princess option of adding a great big, regal, no missing this beauty five metres effort attached to the waist. The guests at the religious wedding, in the Great Church in The Hague, got the full cathedral effect while Margriet got to take off the train and still have a dress fit for a royal wedding party later on. Perhaps the most Sixties part of this whole royal outfit is the fabulous fluff of a veil that sits on top of Margriet's beehive hair. It's so 1967 that there's not really any need for a date on any of the photos, the veil does it all by itself. Margriet and Pieter have been happily married now for fifty one years, with four sons and eleven grandchildren all ready to help them celebrate their latest wedding anniversary. 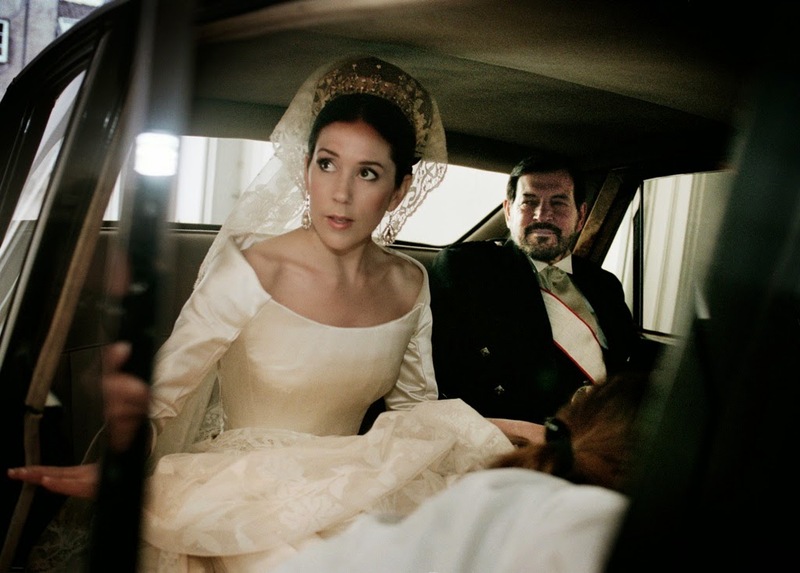 Margriet was a very modern royal bride but her dress is now a vintage regal wedding gown.